The ultimate gift set! 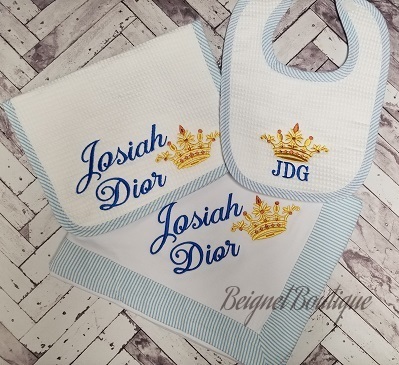 This seersucker bib, blanket and burp cloth set is an absolutely fabulous way to say Welcome to new baby! This EllieO bib, blanket and burp cloth set has a classic seersucker trim. Made with a very soft, luxurious terry cloth back and detailed waffle cone fabric front, it makes the perfect newborn set, baby shower gift or everyday classic items to add to the baby's collection. Embroider with baby's name, or design for that extra special touch. Thread color for personalization will match border color of seersucker blanket. Would you like a smaller set? Select just the bib and matching burp cloth for a lovely gift. Available trim colors are Pink, Blue or Green. * Please Note: If no color is selected, the color Green will be used for the order.